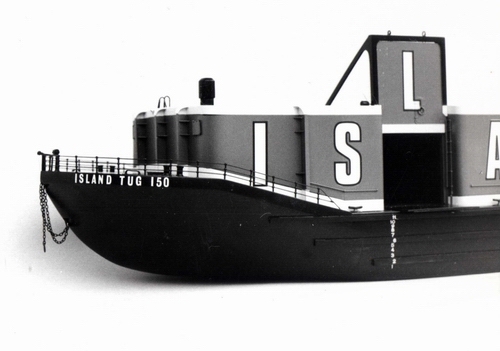 Above is a picture of Island Tub 150, launched in 1965, which was one of he early "Robert Allan" designs for Island Tug. 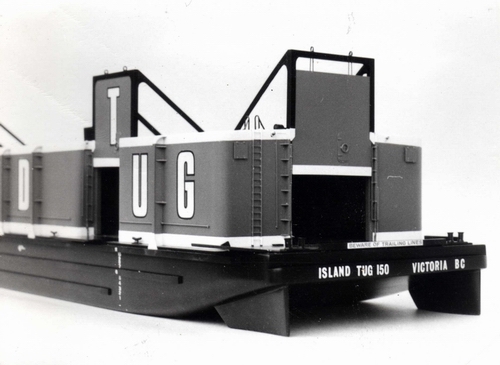 These barges were specifically designed for work up North, on the Mackenzie River, Great Slave Lake, and the Beaufort Sea in the Canadian Arctic. 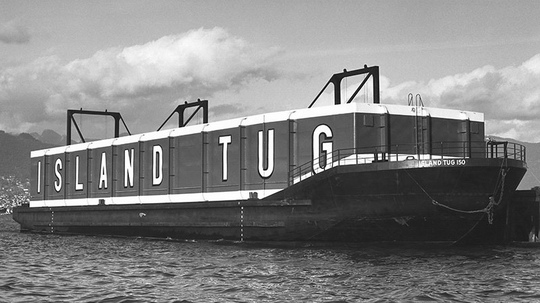 They were unique in that they were all "Double Hull" designed and could work in very shallow water. They could be used to transport "Bulk Oil" (hence the reason for the double hull) or "Deck Cargo"
We were commissioned once again by "Lindsey Model & Design Consultants Ltd.", to work with Robert Allan, the Naval Architect in Vancouver, and build this model in a scale of 1:100. 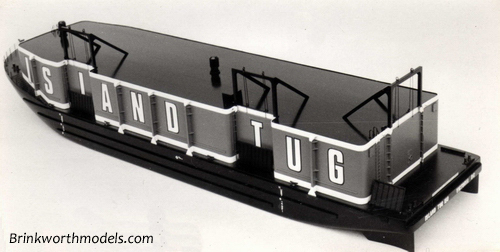 The loading doors on the Port side, and the stern, could be raised and lowered on the model. Pictures below, show the doors in the raised position. We had occasion to visit the Barge, when it was docked in Richmond BC, to take pictures to assist in the modeling. Our model was completed and delivered to Lindsey Models, without a display case as I remember.